Continuing in our series about classic keyboards, the next revelation in keyboards came around 1970 with the Minimoog. During the sixties synthesizers became popular, but were large heavy units comprised of many independent modules. Each module served a particular function such as oscillator, filter modulator etc. To create sound required the interconnection of these modules using patch cables, usually many of them. This created a specific sound but if the sound was to be changed beyond what the controls on the modules could do, it necessitated rewiring the patch cords. Obviously, this was not a big problem in the recording studio, but was not practical for live performance. It also needed a pretty good understanding of the individual synthesizer modules to achieve good results. 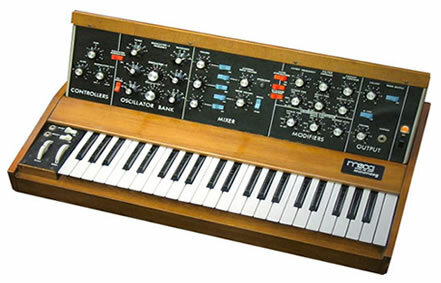 Robert Moog developed the Minimoog as an alternative to the above. He put the most important synthesizer elements into a portable package and connected them internally, controlled by front panel switches instead of patch cords. While this still didn't permit instant changing from one sound to another, it was a whole lot closer to it than using patch cords to set up the sound.The Minimoog had a small 44 note keyboard attached right to it so really the whole synthesizer package was there in one small portable unit ready to plug into a sound system. Let's do a quick breakdown of the most important Minimoog controls. On the front panel left side it had three oscillators which are the raw sound generators. Each oscillator had a control to set the octave range it operated in and also a control to choose one of several waveforms. Each wave form had a different harmonic content which could be chosen specific to the end result desired, The third oscillator also could be used as a LFO (low frequency oscillator) and its output could be directed to modulate the filter or envelope generator. To the right of the oscillators was the audio mixer section. Here is where the output of the three oscillators could be mixed together in the desired ratio and there also were controls to mix in the output of the white /pink noise generator (useful for percussion sounds or special effects) and an external instrument input (to process it through the filters and envelope generators. Further to the right is the voltage controlled filter section. The filter control when set all the way clockwise will pass all frequencies input to it. As it is moved counter clockwise it progressively filters out the highs. Two other controls called Contour and Emphasis also process how the filter's response operates. Extreme setting of these cause the filter to self oscillate adding another spectrum of sounds. The section in the song Frankenstein by Edgar Winter that sounds like a flying saucer is a good example of this.The filter can be controlled by the keyboard and also be modulated by the oscillator so it is able to add real time filtering to each note played. Underneath the filter is an envelope generator. Four controls are used to control Attack, Decay, Sustain and Release. Any sound you hear contains variances over time. A drum or violin has a very abrupt start to its in comparison to a violin where the note almost fades in. This can be simulated using the attack control. Turning it further clockwise delays the beginning of the note. In the same fashion the decay control varies how long the note takes to get from its initial peak down to the point that it sustains for a while at the same level. The release control determines if the note quickly fades out or stays on for a long time. I should mention that there is also a separate envelope generator in the filter section to control the filter's envelope. Down to left of the keyboard are several wheels and switches. The leftmost wheel is the pitch wheel. Turning this wheel up or down from its center position raised or lowered the pitch of the note being played by the right hand on the keyboard. This gave the player the ability to bend notes the way a guitar player can and was one of the most attractive features on the Minimoog. A great example of this is the theme from the TV show Miami Vice played by Jan Hammer. He was so good at this often you thought it actually was a guitar. To the right of the Pitch Wheel was the Modulation wheel. When activated it controlled the amount of modulation that would be added to the note being played from none to full on. It gave quite a bit of expressiveness to the sound because you could go from a plain note to something wild. A great example of this are the final Minimoog notes at the end of You're all I Got Tonight by the Cars. Next to the Mod Wheel were two switches. The first controlled decay. When the switch was off the note would stop when the key was released. When on it would keep sustaining as determined by the Envelope generator. The second switch was for Portamento. This would make successive notes slide in pitch from one to the other. Its rate was controlled by the Portamento knob on the front panel. Remember the Minimoog was a monophonic synthesizer so only one note could be played at a time and the lowest note had priority so the Portamento would make the note transitions blend into each other. This was used a lot by Styx in the Seventies and was very prevelant on the song Never Been Any Reason by Head East. Many digital versions of the Minimoog have been created, but in my opinion the sound is never as good as the real thing. Something about the way the sound is created and filtered by totally analog components is the reason why you see original Minimoogs selling for $10000. Of course there is another side to this. The instrument, even when new, suffered from tuning instabilities due to the temperature sensitivities of the transistors of that time. As the transistors heated up their performance would drift and so would the sounds they were creating. Several versions of the circuit were created as time went on and the stability got progressively better but only to a point. I remember seeing Head East in the Eighties. The Minimoog was an important part of their sound. They had a tech on stage with a strobe tuner whose only job was to keep the Minimoog in tune throughout the show. Now fast forward to today. The Minmoog that when new was unstable is now additionally plagued with aged components,dirty switches and corroded circuit board headers. If there is also electronic component failure, some of the components are no longer available and also it is necessary to find components that meet the tolerances of the other components in the circuit or it will not work right. Interestingly I had two Minimoogs come in my shop from two different customers two days apart. I haven't worked on one in probably twenty years so it was a weird coincidence since I had been planning to write about the Minimoog anyway and now I had two in front of me. In the first one I found a loose component, re soldered it and the unit performed great so I sent it on its way. This unit was on tour and in use constantly so it had been maintained. The second Minimoog had been in storage for thirty years. It is actually the Minimoog used to record the movie Saturday Night Fever. This unit did not fare as well. At first it barely produced any sound due to the amount of corrosion that was everywhere in the unit. After carefully taking it apart and cleaning it, I was able to restore all the functions but it would not calibrate, so it does not play in tune when you change Octaves. I am still working with it and hope to solve this problem soon as this Minimoog is a piece of music history. All in all, the MInimoog has always been one of my favorite instruments and always catches my attention when I hear one.